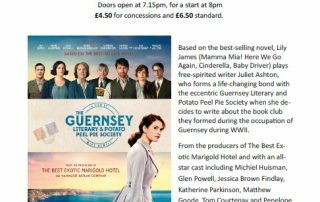 We are delighted to be kicking of a new season of the Wardington Village Cinema on Friday 7th September, when we will be screening "The Guernsey Literary and Potato Peel Pie Society" Please let either Paul or Sam know as soon as possible, if you plan to attend. All details are on the attached poster. 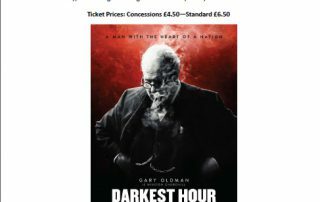 Please book your tickets as soon as possible for the next Wardington Village Cinema event, when we shall be screening Darkest Hour on Friday 15th June (next Friday)! Contact Sam Young on 01295 750 871, Paul Bimson 01295 758855 or email wardingtoncinema@hotmail.com - informing us that you are coming in advance makes the organisation of the event much easier for us. Doors open 7.15pm on with the show to start at 8pm. There will be a half time interval to enjoy your free ice cream and the raffle. Please feel free to bring your own food and drink to enjoy during the performance. Ticket price is £6.50 standard, £4.50 concessions. We look forward to seeing lots of you there. Reminder: Paddington 2 Screening this Friday (20th April)! Please let either Paul (01295 758855) or Sam (01295 750871) know, as soon as you can, if you plan to attend the screening of "Paddington 2" on Friday April 20th, or email wardingtoncinema@hotmail.com The Radio Times: "One of the best movies of the year!" The Independent: "Superior sequel full of charm and humour"
Please book now, to avoid cancellation of Wardington Village Cinema! Wardington Village Cinema Needs YOU! With the latest screening at Wardington Village Cinema this Friday (8th December) we only have 6 people confirmed as attending! Please support us so we can continue to provide this professionally screened cinema experience for the village. Please let either Sam (01295 750 871) or Paul (01295 758 855) or email wardingtoncinema@hotmail.com if you plan to attend. We are showing "The Light Between Oceans" which has very good reviews and should give everyone an enjoyable social evening. We hope to see you on Friday. Tickets: £6.50 Standard £4.50 Standard.